1. 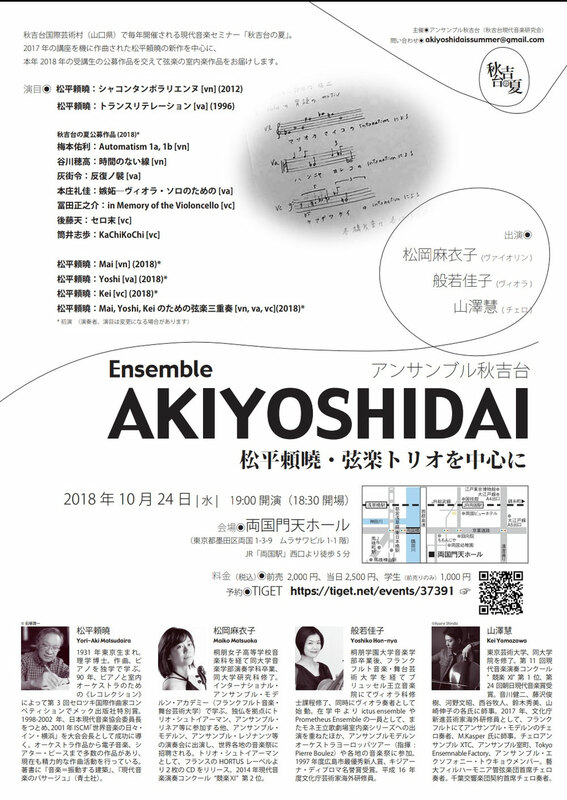 Enrique Granados - Spanish Dance No.5 "Andaluza"
In the Ensemble Akiyoshidai concert of Akiyoshidai Summer Contemporary Music Festivals, "Automatism 1a, 1b" for violin composed by me will be played. the performance is Maiko Matsuoka. I won the second prize in the composition division of the Junior Classical Music Competition in japan. The final selection was held at Nippori Sunny Hall in Tokyo, and the String Quartet No.1 was played. 東京音楽大学付属高等学校 学校誌 現代音楽特集 Tokyo College of Music High School school magazine "a feature on Contemporary Music"
I wrote and edited "a feature on Contemporary Music" at school magazine "VOICE" at Tokyo College of Music High School. This time I posted a message to young musicians about "the importance of contemporary music", an interview with Motoharu Kawashima, a composer. I think that it became very interesting contents, so please have a look. "a feature on Contemporary Music"
■Why does music continue to exist in this world? relationship between composers and performers in each era. Music that was going on at that time was born on the spot and played. Activated by being played music continued to exist. ■Contemporary music cannot be avoided in the classical music world. It is often the case that you become an adult without listening to contemporary music when you are young, upset with the challenges of classical music in international competitions and only notice the importance of contemporary music for the first time in adulthood. However. This is almost as reckless as a person who has not listened to any classical music before becoming an adult, then becomes an adult and participates in an international competition. Listen to contemporary music and play it. Talk about contemporary music. This time is the time when you can realize how important this is; you can be ‘a musician living in the present age’. If you foster a little interest in contemporary music, it will not die as it is said that ‘music is born on the spot , communicated to the audience by the relationship between performers and composers living in that era, so thatmusic continues to live in music’. Therefore, I sincerely hope that I will not forget that music continues to evolve and be as a result of this. By the way, today id the day when Stravinsky’s ‘The Rite of Spring” was premiered just 105 years ago. That being said, it is well known through the textbook that the premiere caused a big uproar, and the police were involved with major injuries sustained. to study contemporary music of the same generation. - "What is the attraction of contemporary music?" As an audience, first and foremost, you can experience the unknown world. You can deal with different music views by each composer, interpret it freely against the expression you were born, and deepen your thought yourself. As a musician, in addition to the above, being able to collaborate with existing composers, that is, involved in creation at the site where music is born, is particularly important as a musician living the present age. If it penetrates into everyday life, inevitably, when heading to the classical repertoire, it is now possible to dialogue with the deceased composer on its own. And as a composer, it is freed from all constraints and freely expresses itself. A journey to find and refine music that only you can do is a pleasure to live. - "Messages to Attached High School Students aspiring Musicians"
The future that artificial intelligence deprives every job from mankind is told in truth. Indeed, the future of musicians is never bright and most of the music work, including composers, will die. But that is the same in every industry, not only music. In the future, the most important thing is to find expressions that only you can do. Even chess that AI has won in a long ago, people do not stop watching people. As Miku Hatsune sings and Android plays the piano, it is required that you express yourself and your expression as if you are yourself, and if that is fulfilled it will definitely open the way. I am optimistic that a truly unique artist is the work that survives to the end. Composer, Kunitachi College of Music, Associate Professor. Known as a work that composes "action music" based on "laughter structure" which regards music as a result of performance acts, he continues a novel approach to various problems in contemporary music. 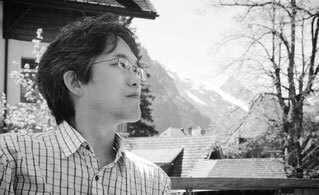 Darmstadt International Summer Courses Kuranihistein Music Award, Akutagawa Composition Award, Toshi Ichiyanagi Contemporary Award and many others. - He opened the door, closed the door, went outside, and started walking from the high school to the station. 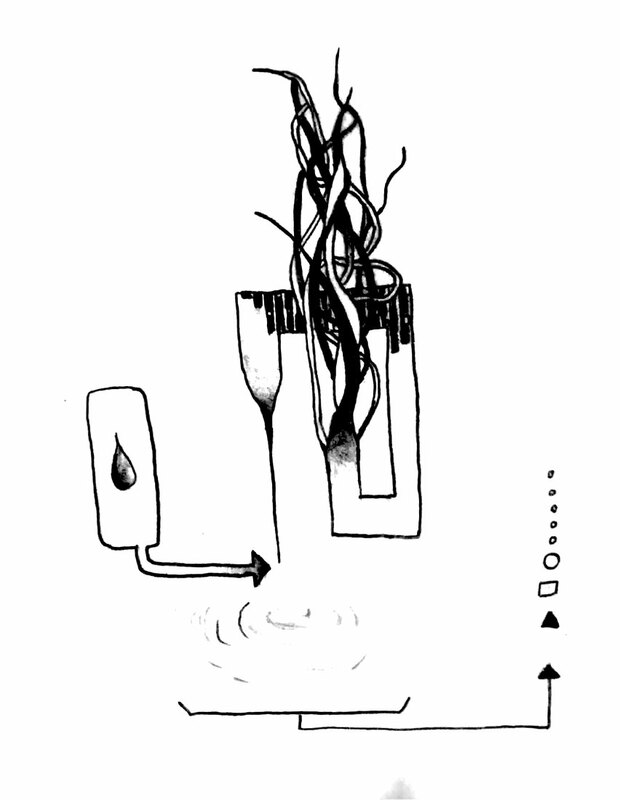 Water flows out from the empty faucet. "This potato chip is tasty!" He said while looking at the calendar. He dropped a glass. close the door. I will look at the calendar. Pour cold tea into the cup he dropped. Drop the pencil and shake the vial. When you look through the fridge, water flows out of the kitchen faucet. "Let's go to another room." He kept walking to the station as it was. There is no strange and beautiful thing more than a dream. Dreams reflect this world fragmentarily but sometimes it reflects a strange world that is unlikely to be this world. These two strange dreams I saw are intertwined with the real world in a complicated and mysterious manner, but it is true that I have not cooked this skillful French cuisine. "It has been like a cream stew of Grenouilles and Papillons for the past three years." This is the conclusion of my 3 year school life, which I got with my best friend last month, but that frog and butterfly appeared intact in my dream. The sacrificial Grenouilles (frogs) are dancing without balming the ballet that seems to come to Stravinsky's "The Rite of Spring", and many papillons (butterflies) are flying around them. The flute represents Papillons and the piano represents Grenouilles. 梅本佑利 Yuri Umemoto - 12 Sickness for Piano (2018) - 8. "Cough"
梅本佑利 Yuri Umemoto - 12 Sickness for Piano (2018) - 4. "Stomach ache"
J.S.Bach Orchestral Suite No.2 Minute "Badinelli"
B.Smetana Sequel Symphonic Poem Má vlast "The Moldau"
I'm so grateful to this choir! Thank you all from the bottom of my heart! I was able to have a very valuable experience during these two days, and it was fulfilling. 主管：Buena Vista Concerts/ The Walt Disney Company (Japan) Ltd.
“Presentation made under license from Buena Vista Concerts, a division of ABC Inc. © Disney All rights reserved”.